The islands of Komodo and Rinca lie between Sumbawa and Flores. They are probably most famous for being the home of the Komodo Dragon, but from a birding perspective they have become best known for supporting one of the last significant populations of Yellow-crested Cockatoo (on Komodo in particular). If you are short of time (or money!) and your objective is mainly to see Komodo Dragon, then a trip to Rinca (pronounced ‘Rincha’) is probably easiest as it lies closer to Labuan Bajo. 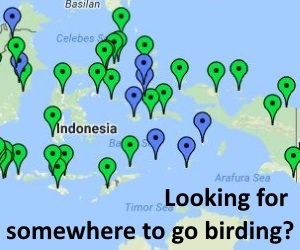 To stand the best chance of seeing Yellow-crested Cockatoo, a trip to Komodo is probably the better bet. Both islands are pretty arid, but Komodo supports more dry forest than Rinca, hence it being better for the cockatoo. On Komodo boats will land at the jetty at Loh Liang, near the park offices. Once you have paid your dues and been assigned a park guide, trails head north into a wide area of dry forest. This is the best spot to look for Yellow-crested Cockatoo and the majority of the land birds. There are three circular trails; one of around 1 km, one around 2km and the third at about 4 km and recommended for a morning’s birding. The cockatoos are easy to see in the early morning and late afternoon though can be hard during the heat of the day. On Rinca boats land at the jetty at Loh Buaya, again near the park offices. Rinca is more arid, at least near Loh Buaya, and the only half decent forest is found in the valley that heads east from the offices. There is more extensive forest in the south of Rinca, but it is hard to access. To see Yellow-crested Cockatoo on Rinca involved either getting very lucky, or more likely getting very distant views by scanning from a hill top. Apart from cockatoos, both islands support plenty of Komodo Dragon, and seeing one at either place should not present a massive challenge, though they can be hard on Komodo between May-July during the breeding season. On Rinca the dragons are always around the rangers kitchens so are always easy to see, but for a more wild experience, a visit to Komodo is recommended. Timor Deer and Eurasian Pig, both introduced hundreds of years ago, are common and very confiding on both islands. When you have had your fill of lizards and birds, then the other thing Komodo and Rinca is famous for is snorkelling. Most charter boats will carry masks and snorkels for you to borrow, and will happily tie up somewhere for a while you can dive in, cool off, and do some work on your fish list! On your way out or back keep an eye open for seabirds, as Bulwer’s and Matsudaira’s Petrel, Sooty and Aleutian Terns and Pomarine Skua have been seen by birders around the islands. Though you are more likely to just see Lesser Frigatebirds, Black-naped and Great Crested Terns. There are no longer any public boats serving Komodo or Rinca, so the only way to get there is to charter one. The closest port to do so is Labuan Bajo in Flores. Pretty much any hotel or restaurant in town will be able to arrange a boat trip, and if that doesn’t work try simply walking along the street until someone offers you a trip; it wont take long! Boat charter can be quite expensive, but you can haggle. Charter boats can normally carry more people than you are likely to have in your group, so you can also try and sell off the extra places to passing backpackers, or join a trip another party has organised. Boats normally include food and drink and snorkeling equipment to borrow, but it is worth checking to make sure during your negotiations. Rinca is a trip of around two hours (each way), so most people will go there and back in a day. Komodo is further, at around 4-5 hours (each way), so can either be treated as an overnight trip, or a long day trip. Leaving just pre-dawn will mean probably arriving early enough in the morning on Komodo for the Cockatoo’s to still be reasonably active and vocal. Standard charter packages will permit about 3-4 hours on the island, but you can organise your own itinerary with your preferred operator, departure time, duration, and anything additional such as snorkeling gear or food. There is a basic national park managed guesthouse on both islands, but many overnight visitors opt simply to sleep on the deck of the boat they have chartered. Alternatively you can visit Komodo by speedboat, and reduce the one-way time to about an hour, but the cost is significantly higher. Both islands lie within Komodo National Park, and you must pay an entrance fee and for a guide on arrival at both locations. In Labuanbajo there are many hotels of all standards, with the cheapest in the centre of town and the most exclusive on the road heading west, or the off shore islands! The airport has been renovated in 2015 and there are regular flights from eg Bali. 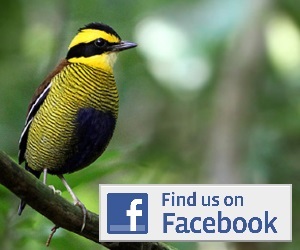 Scroll down the page for related information, including photos, comments, trip reports, guides and services, articles and news.